Does this app look useful to you? If so, please add your email in the form below so I can keep you up to date on the release. I’ve spent lots on productivity apps (to do lists, calendars, task managers) that are all feature rich but almost impossible to use in every day life. The Life on a Page iPad app will help you see everything going on in your life, all on one screen. The app is very simple. 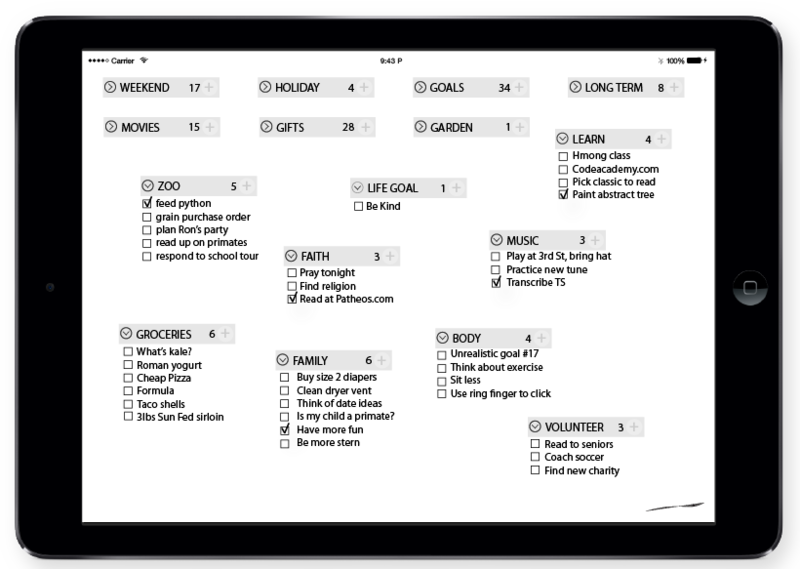 Enter categories & tasks, then move them around the screen in any order you wish. Your password-protected information is stored safely in the cloud. Down the road, your tasks would be accessible via any device. I have a long list of features to be added down the road. For now, I’m starting simple. So if you have an iPad, let me know! I need some early users for feedback once it’s released. Enter your email below or on the Life on a Page website if you wouldn’t mind helping out. We’ll let you know when the app launches in April and just ask that you pay $0.99 or $1.99 for the app. No obligation. Unsubscribe at any time. And yes, I did just post the other day about how to fall asleep using a piece of paper. The Life on a Page concept is also based on a piece of paper, only this one aims to keep you awake and keep you organized.